East Jefferson Fire Rescue firefighter Reece Chambers received a heart transplant Friday. PORT TOWNSEND — When there is an emergency, calling 9-1-1 is what we instinctively do. Within minutes, assistance is on its way to help, whether it is a fire, accident or medical call. Reece Chambers, 41, a lieutenant with East Jefferson Fire-Rescue (EJFR), is one of those dedicated professionals who often answers the call and renders aid. On Friday, instead of helping others, he was on the receiving end of care. East Jefferson Professional Firefighters said Chambers had been No. 1 on the wait list for a new heart and a compatible donor had finally been found after the stress of his work made it evident his heart needed more help. 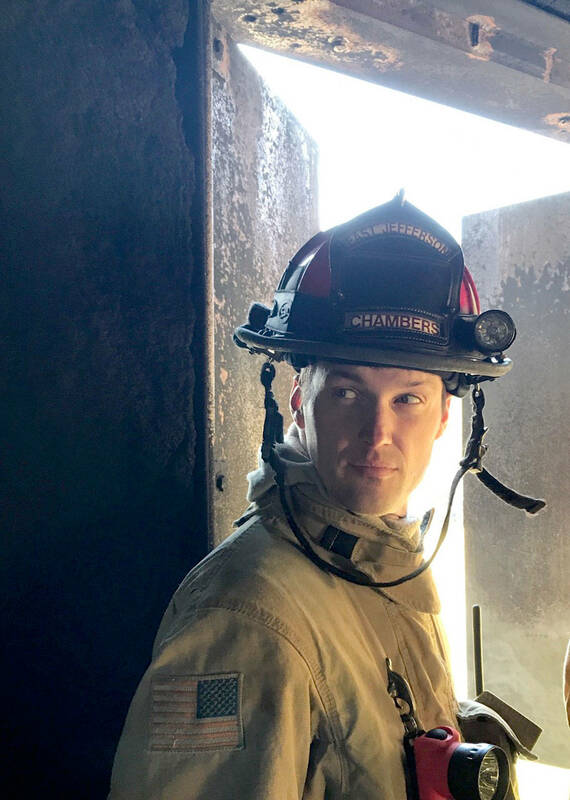 Chambers spent three months at the fire academy as a company officer in 2017 but the work he did there impacted a previously diagnosed heart condition — cardiomyopathy. In January, the non-stop work involved exacerbated his health issues and he was put on light duty. His condition worsened and on July 18, he was admitted to the hospital. The transplant took place at the University of Washington Medical Center in Seattle. According to his wife, Trina, the surgery went well. As of Sunday afternoon, Chambers was taking his first steps through the halls of the hospital. For the past 16 years, Chambers has responded to house fires, car wrecks, technical rescue calls, water rescues and medical transports at all hours of the day and night. His colleagues from East Jefferson Professional Firefighters said he is one of those people whose kindness, temperament and overall personality garner praise from all those he has worked alongside throughout the years. Chambers was hired 14 years ago as a firefighter with Jefferson County Fire District No. 6, which merged to become EJFR District 1. Prior to joining EJFR, Chambers spent two years as a resident firefighter at North Kitsap Fire & Rescue. He became an emergency medical technician with intermediate life support credentials (EMT/ILS), and in 2015, was promoted to the position of lieutenant. “After 16 years of unselfishly giving to the community there has never been a better time to show appreciation for Reece’s dedication to helping others than by giving back to help this young family,” said Lt. Justin Fletcher, family spokesperson. Chambers’ wife is a high school teacher and they have four children: Jaden, 12, Kaia, 11, Isaiah, 10 and Kingston, 10. The children travel from their home in Gig Harbor to Seattle several times a week to spend as much time as they can with their dad since he has been at the medical center. The International Association of Fire Fighters, IAFF Local 2032, worked with Unions America to establish a website where donations can be sent to assist Chambers and his family in the coming months. The website can be accessed by going to www.LetsHelpReece.com. Updates on Chambers’ condition will be regularly provided on the site. Donations may also be sent to the Boeing Employees Credit Union for the Reece Chambers Benevolent Account.